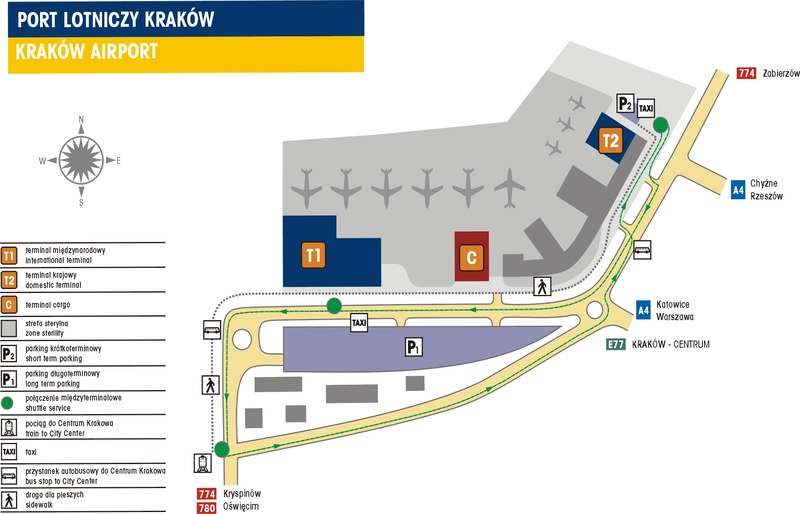 Kraków has a relatively small airport, with one international (T1) and one domestic terminal (T2) with the third one (T4) still under construction. To arrive at the closest vicinity to the Villa, it is best to get off at Sielanka stop. Right after that, follow the Królowej Jadwigi Street, passing by Berbysowa Street on your left, and turn left into 18 lipca 1943 [28th July 1943] Street, which will lead you up the hill to the bridge leading to the gates of Villa Decius. If you encounter any troubles, please call us at (+48) 694 019 440. Since The Historic Centre of Kraków is under a strict preservation in accordance with The UNESCO World Heritage List, there is no public transport or high car traffic inside the borders of The Planty Park, encircling The Old Town since when the City Walls were demolished in the 19th c. Therefore, having been accommodated in one of the Old Town’s hotels, it is particularly difficult to find a parking place which is yet another argument against renting a car in Kraków. All important turist information points may be found on the website InfoKraków and in the local turist information points. It is particularly worthwhile to visit the information point at Plac Wszystkich Świętych (All Saints Sq.) for it usually has a good access to all news about currently organised concerts, festivals, and numerous cultural events that have always been a flagship of the city.